Also acquired from Mr. Bennett's Private Collection were a box of 10 perfectly Still Sealed "The Beatles Christmas Albums" that can be seen on the table. Photo taken at the Fab 4 Collectibles offices, 15 April 2005. 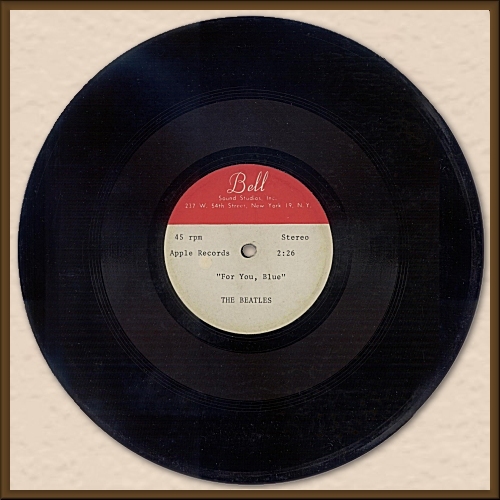 This disc was auctioned by Fab 4 Collecables in June 2005 and would surely be identical to the released version. In 1967, Beatles Manager Brian Epstein died, and, concurrently, the newly formed Apple Records, which was owned individually by the Beatles, was floundering. After Brian's death, the Beatles approached well-known "Promoter to the Stars" Pete Bennett, and asked if he would take over as Promotional Manager for the group (he was then working with the Rolling Stones), and the Apple label in the United States. In early 1968, Pete promoted the phenomenal first Apple single, Hey Jude. All told, Pete promoted five albums for the Beatles, plus a number of re-releases. The albums were: Magical Mystery Tour, The White Album, Yellow Submarine, Abbey Road, Let it Be, and finally the Limited Fan Club 1970 The Beatles Christmas Album. He worked intimately with all the Beatles, and with their producer, George Martin. After the band's breakup, he became the Promotion Manager for all four of the Beatles individually. After the Beatles breakup, he promoted the last Beatles album, Let it Be, which was produced by Phil Spector. Pete became Promotion Manager of Apple Records through a collaborative effort between he and John Lennon. Suddenly, Apple Records went from being consistently in the red to solidly in the black. In addition to the Beatles Solo efforts, Pete promoted Apple records released records by Mary Hopkins, Badfinger, James Taylor, and Jackie Lomax. 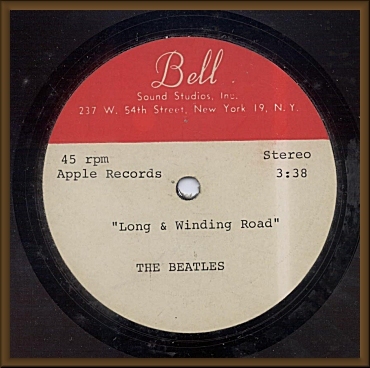 From the Private Collection of Pete Bennett, Fab 4 Collectibles has acquired the only known "A" and "B" SIDED TEST PRESSING STUDIO ACETATE of the Beatles' final released single in May 1970, THE LONG AND WINDING ROAD and on the flip side the George Harrison track FOR YOU BLUE. This is the first and initial test pressing acetate that belonged to Mr. Bennett. It is in Near Mint Minus condition, with typical acetate age soiling only and some superficial scratches. According to Mr. Bennett, this acetate was never played. The original sheen remains throughout. 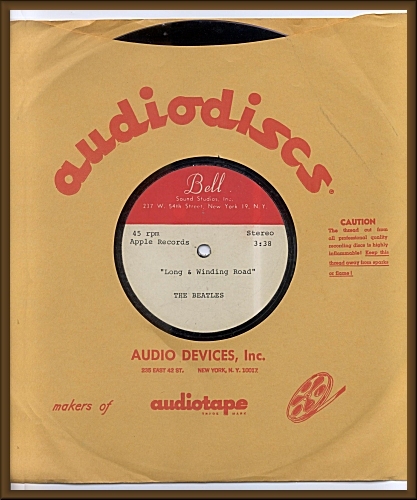 It was mastered by Sam Feldman at Bell Studios in New York City, where many of the Beatles Apple recordings were mastered, including the Let It Be album. 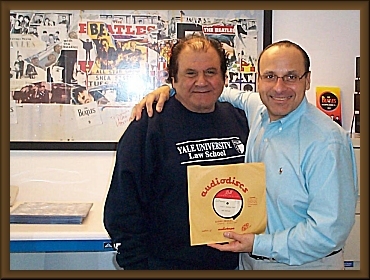 Pete Bennett and Thomas Vanghele with the "The Long & Winding Road" acetate. ACCOMPANIED BY LETTER OF AUTHENTICITY FROM FAB 4 COLLECTIBLES.